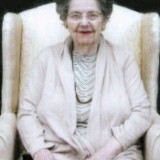 Eileen Coplin, 86, of Avilla, Ind., and formerly of Cromwell, Ind., passed away Monday, April 30, 2012, at the Provena Sacred Heart Nursing Home in Avilla. She was born June 13, 1925, in Montpelier, Ohio, to Harry and Leola (Johnston) Pike. On Oct. 18, 1945, in Detroit, Mich., she married Carl E. Coplin who preceded her in 1997. She retired from Monsanto in Ligonier, Ind., in 1988. 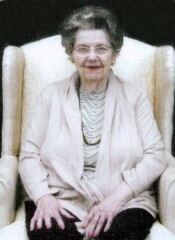 She was a member of the North Webster Church of God where she participated in J.O.Y., a senior group at the church. Mrs. Coplin is survived by three daughters: Margaret (Rex) Beck, Merriam, Ind. ; Betty (John) Bryant, Fort Wayne; and Nancy (Larry) Emerick, Kendallville; three sons: Harry (Sylvia) Coplin, Cromwell; Alan (Gloria) Coplin, South Bend; and Jeffrey (Jean) Coplin, Kendallville; and 17 grandchildren and 36 great-grandchildren. She was preceded in death by her husband; a daughter: Sherry Coplin; a grand-daughter: Brandy Coplin; and a brother: Howard Pike. Calling will be Wednesday, May 2, from 2 p.m. to 4 p.m. and 6 p.m. to 8 p.m. at Eastlund Funeral Home, Syracuse. Graveside Services will be Thursday, May 3, at 11 a.m. at the Lehman Cemetery in Payne, Ohio, with Pastor Jim Kang officiating.